Although I didn’t write about the so-called ‘Shkadov thruster’ yesterday, it has been on my mind as one mega-engineering project that an advanced civilization might attempt. The most recent post was all about moving entire stars to travel the galaxy, with reference to Gregory Benford and Larry Niven’s Bowl of Heaven (Tor, 2012), where humans encounter an object that extends and modifies Shkadov’s ideas in mind-boggling ways. I also turned to a recent Keith Cooper article on Fritz Zwicky, who speculated on how inducing asymmetrical flares on the Sun could put the whole Solar System into new motion, putting our star under our directional control. The physicist Leonid Shkadov described a Shkadov thruster in a 1987 paper called “Possibility of Controlling Solar System Motion in the Galaxy” (reference at the end). Imagine an enormous mirror constructed in space so as to reflect a fraction of the star’s radiation pressure. You wind up with an asymmetrical force that exerts a thrust upon the star, one that Shkadov believed could move the star (with accompanying planets) in the event of a dangerous event, like a close approach from another star. Shkadov thrusters fall into the category of ‘stellar engines,’ devices that extract significant resources from the star in order to generate their effect. There are various forms of stellar engines that I’ll be writing about in future posts. But to learn more about the ideas of Leonid Shkadov, I turned to a recent paper by the always interesting Duncan Forgan (University of Edinburgh). Forgan points out that Shkadov thrusters are not in the same class as Dyson spheres, for the latter are spherical shells built so that radiation pressure from the star and the gravitational force on the sphere remain balanced, the purpose being to collect solar energy, with the additional benefit of providing vast amounts of living space. Figure 1: Diagram of a Class A Stellar Engine, or Shkadov thruster. The star is viewed from the pole – the thruster is a spherical arc mirror (solid line), spanning a sector of total angular extent 2ψ. This produces an imbalance in the radiation pressure force produced by the star, resulting in a net thrust in the direction of the arrow. The sheer size of Dyson spheres, Shkadov thrusters and other stellar engines inevitably makes us think about such constructions in the context of SETI, and whether we might be able to pick up the signature of such an object by looking at exoplanet transits. Richard Carrigan is among those who have conducted searches for Dyson spheres (see Archaeology on an Interstellar Scale), but Forgan thinks a Shkadov thruster should also be detectable. For the light curve produced by an exoplanet during transit would show particular characteristics if a Shkadov thruster were near the star, a signature that could be untangled by follow-up radial velocity measurements. The chances that we might pick up a transit showing clear signs of extraterrestrial engineering seem remote, but Forgan’s point is that we have numerous exoplanet surveys in progress, ranging from analysis of the Kepler data (with a recent SETI component factored in) to future surveys using the TESS and PLATO instruments, each intended to undergo radial velocity scrutiny as a follow-up to any detections. The GAIA satellite will also provide useful data for possible follow-ups of transit candidates. With all this in the mix, Forgan wants to clarify what a Shkadov thruster would look like if by whatever chance we do find one in our data. The presence of a Shkadov thruster, he demonstrates, can be flagged by study of the lightcurve of both transiting planet and thruster, with the possibility that both the primary and secondary eclipses can be affected. It would be a tricky catch even so, for transient phenomena like starspots can mask features in the lightcurve, and Forgan thinks that further radial velocity studies, along with interferometric imaging and asteroseismology would have to come into play to tease out the features of such a thruster. Missions designed to study exoplanet atmospheres — he mentions CHEOPS or EChO — could be used to confirm the thruster’s presence. A long shot indeed, but it’s good to have this study of those features that would flag a lightcurve as anomalous and indicative of advanced engineering. For while the probabilities of finding a Shkadov thruster are remote, we’ll have a growing number of datasets from various exoplanet missions to draw on. Interstellar archaeology is all about digging into this rich stratum to see whether any observed events fit models that suggest the presence of artificial objects. And today’s exoplanet catalogue only hints at the volumes of information still to come. The paper is Forgan, “On the Possibility of Detecting Class A Stellar Engines Using Exoplanet Transit Curves,” accepted for publication in the Journal of the British Interplanetary Society (preprint). Leonid Shkadov’s paper on Shkadov thrusters is “Possibility of controlling solar system motion in the galaxy,” 38th Congress of IAF,” October 10-17, 1987, Brighton, UK, paper IAA-87-613. More on stellar engines in coming weeks. Why not construct the mirror so that the reflected light is not reflected back onto the star, but past it? This would mitigate the effects of the reflected energy on the star, and increase thrust, nearly doubling it. My question is, how is the thrust imparted to the star in each of these scenarios? In the basic Shkadov thruster, asymmetric net light emission from the star exerts a direct thrust on it. But there must also be a net force as the star is attracted towards the mirror. In my variant, it seems that only the gravitational attraction towards the mirror is in effect. What am I misunderstanding here? Boy, I should not get behind in reading my copies of the JBIS,… the Forgan paper totally escaped me. I would have included it in my Extreme SETI talks at the interstellar flight meetings this year. I had known about the Shakodov paper since 1990, and had a copy of the paper stashed away, but had forgotten about it! It was your article, Paul, yesterday that had me go dig it out. I might be misremembering by I think I called Greg Benford’s attention to it in the 1990’s , but then again he may have known about it anyway. There is another astro-engineering project that one might look for. The idea being , that when the Sun moves off the main sequence, or actually before it really reaches red giant , the Sun will be too hot for Earth habitation (less than a billion years)… move the earth by using gravitational slingshots , trading momentum and energy with Jupiter. One has to use an almost 1000 km asteroid or Kuiper Belt object to move the Earth at a rate that keeps it in the ‘habitable’ zone. It’s such a long term process, I don’t know if it would be observable at interstellar distances. Would the thrust produced by such an arrangement be comparable to that of a more conventional solar sail? I often see a figure of 9 N per square kilometer in that regard, at 1 AU distance. Or, is the thrust not produced directly by light-pressure, but through some other means related to reflecting the energy back onto the star’s surface? How close to the star’s surface would the Shkadov thruster-mirror need to be positioned to work properly? I suppose the farther away it was, the wider the mirror would have to be to deflect the same amount of energy, and maintain gravitational equilibrium, but there would be a minimum distance at which the mirror could survive without melting. One other thing just occured to me: Perhaps a system such as this could be adapted for use with a black-hole Hawking Radiation thruster. The radiation involved would be more intense, but the physical dimensions of the system could be much smaller, too. And I imagine that a civilization capable of building a Shkadov thruster might be equally capable of securing or manufacturing a suitable black hole of relatively “modest” mass. I’m enjoying this series of posts, Paul… advanced Type-II civilizations powerful enough and patient enough to move entire stars, it really captures the imagination. One can imagine steering our solar system to avoid dangerous close-encounters with other stars, or even transforming our entire planetary system into a giant generation ship on a slow trajectory to other parts of the galaxy. Of course, the scale of engineering really boggles the mind. Inducing “hot spots” on a star with particle beams, building an enormous mirrored bowl over one half of the star to transform it into a photon thruster… either of these schemes requires a civilization to learn to the energy and material resources of stars rather than mere planets. I would like to ask, though, does anyone know the estimates of how long it would take to accelerate our sun by these methods, and what the travel time to various destinations would be? How long would it take to approach the Alpha C system by these means, for example? I imagine it would be slow, but with such a “ship star” your entire planet and civilization come with you for the ultimate generation ship!! There seems to be an assumption that if you apply thrust to the star its planets (those you haven’t deconstructed to build your megastructure) are just naturally “dragged” along. Is there an explanation of how that actually works without the constant thrust, however low, tugging your planets out of equilibrium? I don’t understand why an idea like this can even make into a paper. Some very simple back of the napkin calculations show this to be impractical. With a mass of 1.98E30 kg and burning away about 6.3E11 kg per second in the fusion process. Let’s be extremely generous and assume that 100% of this mass loss is capturable/reflectable start light momentum that could be harnessed. We now have at our the power to adjust the speed of the Sun through space by with a 1.25 mm(millimeters)/s change over a 1 year period. That means that over the remainder of it’s lifetime (lets say 10 Billion years for simplicity) it could be adjusted by 623 km/s. That seems to me like not moving at all. But lets look at a brighter star like R136a1. It’s about 8 700 000 times more luminous than our Sun and 263 times as massive. This larger star is more agile than Sol with a whopping acceleration of 4.1 m/s change per year. Much better. That means we should be able to make significant changes in velocity in 10,000 years with a lifetime delta V (assuming a generous 10 million years) of 41 000 km/s. That seems better but with such a short lifetime planets would have to be “imported” from elsewhere to get any use out of such a short lifetime star. Additionally with massive stars occasionally shedding their outer layers. They seem like more of a problem than they are worth. Again all these calculations are making heavy assumptions all in favor of more acceleration so the actual values should be much lower. The bottom line is this isn’t practical regardless of technology level. It would be more feasible to have autonomous factories around stars producing antimatter from solar power, flinging these packets of antimatter across light years in isolation capsules to a planet whizzing through the galaxy for use in heating/powering and the acceleration of the planet. Would the thrust produced by such an arrangement be comparable to that of a more conventional solar sail? I often see a figure of 9 N per square kilometer in that regard, at 1 AU distance. If the mirror was at 1 AU, this would indeed be the approximate thrust. Bringing it closer and reducing its size while maintaining the covered angle would leave the total thrust unchanged, with an increased thrust per area. The total thrust would be astronomically large, but because of the even more astronomically large mass of the star would translate into astronomically minuscule acceleration. Stars take billions of years to burn a significant fraction of their mass, and it is this same time scale in which any substantial delta-V could be achieved. Unless you can greatly speed up the burn rate, but that would surely fry any planets that might exist…. Kinda hard to imagine the amount of work required to engineer something like this with Earth’s resources alone. Humanity would have to develop into a purely scientific, engineering society to even begin a project on a scale of such enormity (until, and unless we enter into an age of deus ex machina, in the literal sense of the translation). Just thinking about it gives me fatigue. Although, I’m very excited to see that literature is being published on the topic, mainly that paper on modifying planetary orbits shared by Dr. Jackson. Oh la la! Maybe then, Rogue objects are possible candidates for what we importune, both as candidates for extraterrestrial spaceships AND satellites for orbit modification? Lucky for us, PSO J318.5-22 is only 80 light-years from us. Any interstellar artifacts modeled after what we have in mind would be impossible to miss, simply by the size. It is puzzling, though, to envisage how someone would actually come to think that civilizations based on the Kardashev scale could prosper in the universe. If the level of ‘have’ and ‘have-nots’ disparity exists in an ETI group on the upper echelon of Type II (and if they didn’t function like ants or bacterial colonies) then I fear there would be some really friendly, happy, benevolent creatures and/or on the other end of that spectrum some horribly miserable, more-than-short-tempered a-holes, who if we contacted, would not have the patience for us Type I workers (they’d probably be more concerned with how to whore us and our solar system for energy). So if we find structures like these somewhere near to us, let’s just play a game of I Spy… until we are at such a level ourselves. However, the energy consumption of a high Type II or Type III human race would eventually increase so exponentially that it gives me a headache to think about the attitude present in the populace if no kind of biological adaption took place. The universe would suddenly become so small and boring that I think a project like this would eventually be abandoned and the idea of extinction wouldn’t become as much of a big deal–that is, after we expended the possibility of existence in virtual environments, as well (i.e. technological singularity). I guess that would make my question, when there is nothing left to discover, will our desire to explore infinity go away? Or, is contentment/complacency a contributing factor in the extant loss of our extinct earthly brethren? When will we want to stop or be happy with the state we have chosen? Was it a choice or was this given to us by evolution? Is the way we utilize energy instinctual? Maybe we can actually now scientifically test the claimants based on light radiation pressure and see what kinds of beams were used to abduct them? “[F]orce generated by the stellar radiation ﬁeld on its surface is matched by the gravitational force of the star on the mirror”; i.e., the backward force (thrust) acts on the shield and is just sufficient to maintain its position. Where’s the force to propel the system? I see only the gravitational attraction of the shield on the star, and this would be close to negligible. @Alex Tolley: In your lens formation, the force exerted by the transmitted rays would thrust the lens toward the star, with undesirable consequences. Gerry: When the weight of the reflector is matched by the photon-pressure, because gravity intensity and light intensity are both obeying the inverse-square law, then ANY distance is fine. The minimum distance is the when the maximum operating temperature is reached, though a perfect mirror can be used right up to the corona. The maximum depends on how big one wants the mirror surface to be. A Skhadov thruster deliberately avoids “boiling” off stellar mass to enhance thrust, though other thruster arrangements might deliberately encourage such eruptions. The elegance of the Skhadov approach is that only the star’s natural output is required. Alex: If the Sun was a geometric point source, then that would be trivial, but as it is an extended light-emitting object, then some reflected light will always fall back on to it – it will always “see itself” in the reflective surface. But as the star is not totally wrapped in mirror, then heat will still escape. Surprisingly a wrapped star that can’t emit energy will expand until it becomes a hot isothermal sphere with no more fusion reactions occurring. Red Dwarf stars are ideal because they process almost all of their hydrogen. I’d like to see a stellar starship enter hyperspace. A mechanism where the star intakes interstellar or intergalactic hydrogen and expells mass at the same rate of intake might perpetually accelerate. Some means of constant input and output would be needed. The idea is a stellar ISR. Perhaps a giant magnetic scoop could be used to funnel in hydrogen for more timely acceleration. Blue stragglers as indicators of extraterrestrial civilisations? and F_max is invariant of Dyson Bowl radius, inverse square dependence for p_max is compensated by the same dependence for useful area. that takes a hundred thousand years to accelerate to 1 m/s^2. More, max thrust (ignoring secondary effects) depends only on luminosity and is very close to L/c and thus much higher accelerations are possible for O- and B-type stars. They are cosmic rocket trucks with hundreds of thousands of sol-powers and capable of tyre-burning 10^10 seconds acceleration from zero to 1 kph! On the opposite, for M-dwarf s a_max is 100-1000 times lower than for the Sun and it’s hard to get them moving at all, ten trillion years needed to get Barnard star to it’s present velocity. It appears it could be much more effective for some analog of ablative thrust vhen instead of bowl there is a ring which concentrates starlight on a very tight spot on the star’s surface, superheating it to millions of degrees and evaporating avay, providing traditional reactive force by “ablation pressure”. An additional thrust can be madeby separate set of reflectors concentrating the starlight on the plume and accelerating it by light pressure, but such possibility depends on possible plume dynamics and efficiency of such heating – the plume would be transparent. Here the cosmic race analogy gets wonderful, we get the basic power – Shkadov thrusters, and nitro booster by the ablation thrusting, where is a tradeoff between thrust, energy efficiency and the fact that diminishing stellar mass moves it down on HR diagram and permanently decreases it’s race dynamics. Get the steady acceleration by Shkadov’s, or boost by ablation with high speed plume, or a desperate dash with slow I_sp and high mass flow, but don’t go in too much, it takes solpowers from main engine! The Sun, some quick number crunching reveals, has a power output of 0.0002 W/kg. An exhaust velocity on the order of Solar escape velocity would seem the lowest feasible one to consider. Using this power output to efficiently generate a 600km/s stream of particles, you’d be expending mass at a rate of about 1e-15 kg/kg solar mass. You could plausibly keep that up for 140 million years, using up half the Sun’s mass. That would generate an acceleration of about 6e-11 Gs. The Sun would pick up about 0.02 m/s each year. At the end of the multi-megayear burn, the Sun would be moving at a rather respectable 2.6 million meters per second, just under 1% of the speed of light. Just rough calculations, you might consider doing something like this for an intergalactic trip, but I can’t see it being feasible for shorter journies. Too low an acceleration. somewhere on here maybe last year I posted an idea that had to do with using the Galaxy’s black hole to gravity assist an inhabited planetary system to a more distant target. @Alex Tolley with “What am I misunderstanding”. I think it is more a misreading were your missed the bit where it says “Shkadov thrusters are not in the same class as Dyson spheres”. No unobtainium required – built with simple design that we could do now, save for the scale. My guess is that your scheme is not. @David Shafer – the star’s lifetime delta v budget might look like 623 km/s to you, but to me this is just a course adjustment or steering budget, with the real delta v budget coming from repeated slingshot effects from close stellar encounters. @Adam, yes if much reflected heat goes all the way to the core, output will drop. I assume that effect is negligible here (I guess you do too), but would love to know. It reminds me of a thought experiment of mine, where Dr. Evil drained heat from the sun’s core into another dimension. Naively, I thought that would reduce its output in our world, till it struck me that the for thermal equilibrium reasons that was impossible. 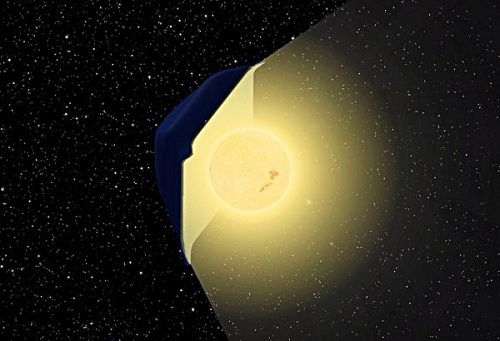 A shrunken solar core in equilibrium with the identical nuclides would have to throw more heat through its shrunken surface or it would expand to its previous size. No need to do detailed calculations – Dr. Evil’s sun must heat up !! I wonder if the result here is also counterintuitive. As one poster has pointed out, in order for the reflector to act as a statite, the sole critical parameter is the areal mass density of the reflector. 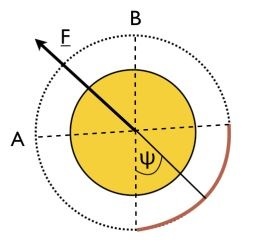 It works at ANY distance from the sun, in the sense that gravitational attraction is balanced by photon pressure, since r^2 cancels on either side of the force equation. However, the acceleration imparted to the sun, for a given reflector size, DOES depend on its distance from the sun, and that in turn depends on the maximum tolerable temperature of the reflector material. Something around 2000 deg. K is probably about right, and thus about 6 solar radii out (Mercury is at about 71 radii). I hold it to be a wholly foolish idea, since due to the colossal solar mass, acceleration will be miniscule for all realistic scenarios and one needs millenia to see any substantive effect. Far better to use that solar power immediately for a network of mirror-based beamers for transportation around our system and for interstellar propulsion. But there must also be a net force as the star is attracted towards the mirror. In my variant, it seems that only the gravitational attraction towards the mirror is in effect. What am I misunderstanding here? I think you are right. When you look only at the star, it still sends photons in all directions, with no net force. Some hit the mirror, and accelerate it away from the star. It is only the gravitational attraction that keeps the mirror from escaping and transfers the force to the star. Alex Palfreyman, have you ever ponder just how much propulsive capacity the Sun’s power implies? If 4 petawatts of beam energy can push a 1000 ton payload (starship + mag-sail) to 0.5c in 6 months, then 100 billion starships can be accelerated by the Sun. I think moving the Sun and starships can be budgeted. If the Mach/Woodward or QVF thruster proves effective, even if not for FTL, could our descendants build a giant solar-powered warp drive ring around the Sun (neglecting for the moment all the “Ringworld”-type engineering problems that would entail) and use it to move some or all of the solar-system through space at some useful fraction (or maybe multiple!) of c? I suppose one would first have to know how much energy it would take to create whatever the required amount of negative mass/energy in the first place…among other problems. Not millenia. It is considerably worse. It takes millions of years to see noticeable effects, and billions to achieve velocities higher than those normal for stars. I think that, if you can power 100 billion starships for the same energy budget that will achieve a measly 6e-11 Gs of acceleration, you’d be mad to move the Sun. It’s like deciding to travel by directed crustal drift instead of hopping into a car. You can’t even justify doing it because the Sun has sentimental value, and you want to bring it along, because you’re destroying it to move it. Why not beam that power, and just use it to move the planets? The same power output that will barely budge the Sun, would throw the planets around like tenpins. I think folk are getting to hooked up in the energetics of this scheme. It was always obvious that it makes no sense to build these mirror arrays if stellar travel is the aim. These mirrored surfaces would have to be built for a different purpose, and the Shkadov thruster suggests a way that these can be arranged to facilitate interstellar travel. Stars get hotter with time, perhaps they just want to cool their planet. Anyhow, this setup would provide a secondary mechanism for that. Each close encounter with another star would perturb the orbit of their home planet. This ETI, would only require net movement of 1au per encounter to have their planet in the right ‘phase’ for these perturbations to work to their advantage. It would allow them to place their planet where they want at the next encounter. Here is the real problem. These close encounters + infinitesimal steering budgets are so powerful a mechanism for moving through space, that we could set up a new stellar rendezvous every couple of thousand years, even at our distance from the core. That seems not nearly enough to move even just that one au. Does that mean it is better still to abandon your planet altogether? Next post: Is Energy a Key to Interstellar Communication?